Politicians who agreed on a bipartisan, collaborative approach to tackling Nova Scotia’s health-care crisis spent their first meeting arguing over how often to meet. The legislature’s standing committee on health had its inaugural meeting Tuesday. The nine-member committee includes five Liberals, two Conservatives and two NDP members. The frequency of meetings was the first item on the agenda and members spent over 20 minutes arguing how often they should be held. 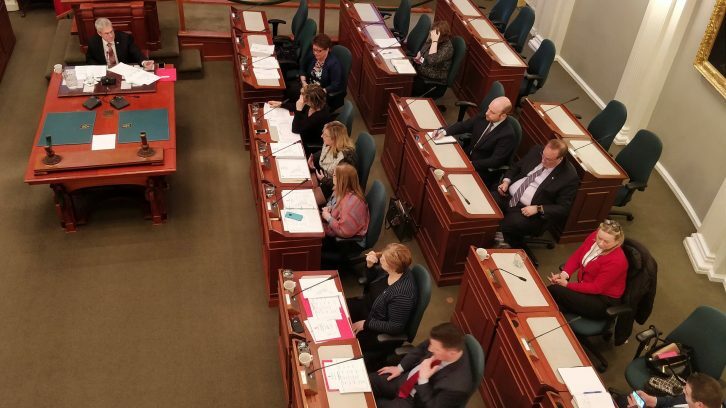 The Liberals unanimously struck down a motion, put forward by NDP member Susan Leblanc, for bi-weekly meetings, voting in favour of monthly ones. For some committee members, Tuesday’s debate raised concerns about the committee’s effectiveness. “What are we doing here if we cannot commit to meeting bi-weekly to discuss the current health-care crisis … why will this government not want to commit to work together to resolve the issues in health care,” said NDP member Tammy Martin. Conservative Barbara Adams was also concerned about the committee’s future. “The fact that we’re even having this debate on how often to meet is a bit disturbing to me as to how this health committee is going to roll out,” she said. In other instances, Conservative and NDP members were visibly frustrated. For example, Martin shook her head as Liberal Ben Jessome made the case for monthly meetings. The Liberals also used their majority to strike down a motion which would grant each party an equal number of witnesses during the meetings. Witnesses called on would include medical professionals and other experts with relevant information for the committee to consider. The Liberals unanimously favoured a split which grants them three witnesses, the Conservatives two and the NDP one. Plans to set up a bipartisan committee to tackle Nova Scotia’s health-care crisis was first announced in September 2018. Recent data from the Nova Scotia Health Authority shows more than 50,000 people, or approximately 5.7 per cent of the province’s population, are still waiting for a family doctor. Additionally, wait times for hip and knee surgeries in Nova Scotia are among the worst in Canada. The province ranks last for hip replacement surgery and second to last for knee replacement surgery, according to recent data from the Canadian Institute for Health Information.